How to leave an environmentally friendly corpse. 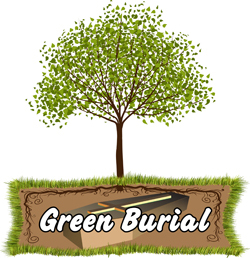 Going In Style, The Family Funeral PlannerAn option which has become popular in the UK and is beginning to catch on in the USA is ‘Green Burial’. This comes in many degrees. For the purist, there are green cemeteries which do not allow embalming, caskets with non-biodegradable parts, or traditional tombstones/monuments. The body is buried somewhat shallow to accelerate decomposition and return to earth and is marked by GPS or perhaps a natural rock or newly planted tree. Expect to pay $500 to $2500 for burial plot and services. 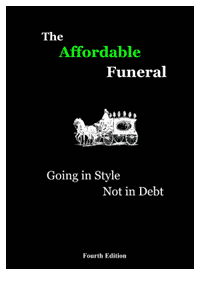 $2,000 – $5,000 and up, depending on location and local pricing by funeral homes and cemeteries. A HINT! Many funeral homes are starting to offer ‘Eco-Friendly’ caskets at a premium price. For a truly biodegradable casket that has no metal of any sort, ask for a KOSHER or Orthodox Jewish casket as these are often available at prices 1/3 to 1/2 what you’d pay for the same thing dubbed ‘Eco-Friendly’.